One of the most infamous moments in sports history of the 1970s is being analyzed in the new film, Battle of the Sexes, starring Steve Carell and Emma Stone. Of course the moment I am talking about is the tennis match between Women’s tennis star Billie Jean King and senior tour and former tennis legend Bobby Riggs. The match between these two was at the center point of the argument of equality of the sexes in sports and in society, an argument that we are still having today. Bobby Riggs (Steve Carell) has become a hustler, someone using his great skills in tennis to con his friends out of money. A obsessive gambler, Riggs was always looking to find that next big money making opportunity. When a dispute between Billie Jean King and Jack Kramer (Bill Pullman) led to King pulling out of the tennis organization to create another one, Riggs saw an opportunity. He challenge King to a one-on-one battle of the sexes. King refused and continued on with her career, but when Women Tennis #1 player in the world Margaret Court (Jessica McNamee) accepted and was defeated by Riggs, Billie Jean felt as if she had no choice but to defend women tennis players everywhere from the self-referred “chauvinist pig” in Riggs. The film features much more than just the match though. It deals with both individual characters and their lives in great deal, especially the struggle of Billie Jean King trying to deal with her sexual status. Though married, King had an affair with a hairdresser Marilyn (Andrea Riseborough) and she found herself distracted and confused. Riggs, on the other hand, had to deal with his gambling that took a toll on his own family, in particular, his crumbling marriage to his wife Priscilla (Elizabeth Shue). Riggs is portrayed very interestingly here as he seemed to be a showman, and I even thought for part of the time that he did not actually believe the garbage that he was spewing. One of the most fascinating parts of this film was the historical setting that the film took place within as the attitude of men when dealing with women at the time was astounding. Someone like Jack Kramer is out and out a chauvinist and he said things that were shockingly rude, and yet was typical of the time. We even heard words of condescension from Howard Cosell, who actually called the match for ABC. Though there are still many issues when dealing with women’s rights and the equality of the sexes, seeing how the world was at this time was a real eye opener. I did find that the film dragged a little bit during the middle of the film and I am not sure that I ever truly bought the relationship between King and Marilyn as portrayed here. The true strength of this movie is the performances of its two lead actors. Steve Carell and Emma Stone are wonderful here and I would have liked to see even more of the interactions between them. I think Carell in particular brought the charismatic and enigmatic Bobby Riggs to life on the screen and you find yourself rooting for him. He was not just the misogynistic villain of the film, but instead a real person that you can’t help but like. The tennis scenes at the end of the movie are tremendous and really put a strong mark on the film itself. 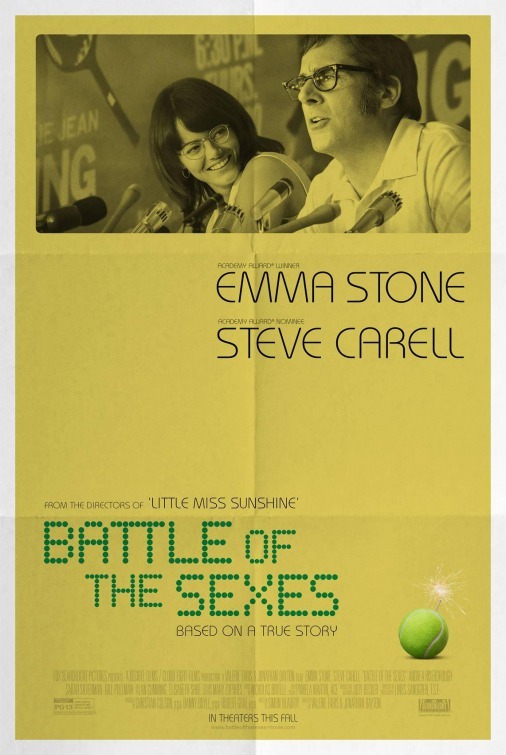 Battle of the Sexes shines a light on a really amazing time in the world of sports as Billie Jean King took a huge stand against the tennis establishment and brought along with her an entire generation of women libbers.